This lingering 30-degree weather makes me wish I lived in a tropical climate. Such warmth. Year-round warmth. I say that now, but as someone who's known me for 25 years, I'm fairly certain that I'd find something to gripe about. That's just how I roll. A few weeks ago, I was contacted by Oh! Nuts, a fabulous company offering everything from nuts (duh) to dried fruit to coffee and more. They were kind enough to send me some of their goods to sample and evaluate. I received some cherry rock candy and ice cream sundae malted milk balls, both of which made fantastic noshes. They also sent some cinnamon almonds (they know me without even knowing me! ), dried apple slices (more on these items later), and macadamia nuts. The macadamias are spectacular. First of all, they're massive. Gigantic. Gargantuan. Further, they're already shelled, salted, and roasted, so the work has already been done--all you have to do is chew! I wanted to use a few of them in a dessert and, feeling a bit despondent about this weather, I had as close to an epiphany as I ever come--a tropical version of Hello Dollies. Instead of walnuts or pecans, I used the macadamias, and instead of chocolate chips, I went with white chocolate (I'm not sure what's island-like about white chocolate, but let's just go with it, okey-dokey?). I kept the coconut and tossed in some dried banana too, just to carry on with the tropical theme. Unsurprisingly, they're delightful bars. Crunchy, salty, sweet, chocolate-ridden--could one ask for more? Yes, one could. One could ask for a little warmth. Combine the melted butter and graham cracker crumbs and place in a 8x8" baking dish, patting the mixture down evenly with your hands. Sprinkle on the white chocolate chips, coconut, macadamia nuts, and banana pieces on top of the crumb mixture. Pour the sweetened condensed milk evenly over the entire mixture. Bake for 25-30 minutes, or until the top is light brown. Let cool completely before slicing. 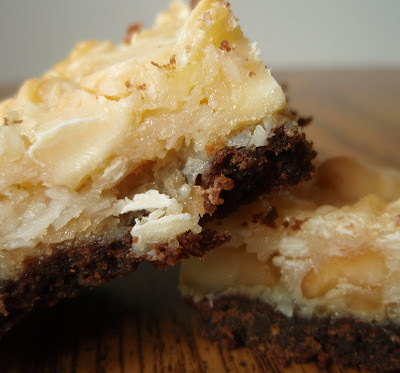 Ooh these sound like majic cookie bars but so much more Aloha! Love the banana bits in there. Something to really go bananas for. Ba-dum-bump! Sounds like you got some good stuff in that package! What a great combination, and it does sound very islandy. Those macadamias look incredible! Those look awesome! I adore macadamia nuts, but don't indulge too often. I could eat an entire jar in one sitting. These look incredible!! Anything with macadamia nuts is a winner! What a fabulous way to put some sunshine into your day. Those nuts look wonderful and the bars are a perfect way to showcase them. Yum! Those look so decadent and addictive!I so want one, right now! Great idea to use the macadamia nuts. Hope you get that warm weather soon! Yes! Tropical! Love love love these. Perfect for my ever-lasting coconut kick. I'm dying for a little bit of tropical weather too! The name is so cute and I bet that they taste fantastic. Coconut and white chocolate is such a great combination and I bet that the saltiness of the macadamia nuts is delicious with all of that sweetness. I don't know why but i think white chocolate is very tropical along with the nuts (wow) and the othe obviously aloha ingredients. These are perfect Grace! That is just the kind of freebie I would love to get! This looks lovely Grace....there is something so tasty about using macadamia nuts in sweets mmmmmmmmmmmm. yes even us californians wish it were warmer like the tropics... looks delicious I love all of the ingredients! Yes this time of year I'm very happy to live in Alabama, not so much in Aug. however;-P Anyway what an awesome giveaway! Your bars look fantastic! great flavor combo! YUM!! Excellent modification of the hello dolly bars!! Don't you worry, the warm weather is coming, and then we'll have to "Beat the Heat"... Couldn't help it. :) Fantastic looking bars. Well, we were near 80 here on Saturday, only to get snow today!! But I could go for one of these bars - I love macadamias! I wish I lived all year long in warm weather. Great treat, looks so good. I keep telling myself that spring is coming. I'm also telling myself that I'd like one of your island bars about now. My husband has been out of town--I am dying to get caught up on Dollhouse ever since you left that comment at my site! It is cool and rainy here today-we need the rain for the farmers, but kind of depressing. Those bars would make the rain not bother me, well, not as much. Look delish! Love the name and they look so very good too. Great idea. My husband loves traditional hello dolly bars, I bet he'd love these too. They sound fabulous! Sweet wounded wuffles. All I have to do is swap out the chocolate for reg grapham crackers (allergic!) and add some caramel...and I'm in heaven! MMMMM...those look so delicious!! Yum Yum!! Fantastic! I'm feeling tropical already. OK perhaps it might be because it's still warm here but these do look delicious! Oh my, did you say salty and sweet? My favorite combo. These look decadent! What white chocolate is tropical, atleast it goes in most tropical baked goods so same thing right! Anyway these look fantastic and perfect for the warm weather that needs to come now! I looove macadamias, they always remind me of Hawaii! 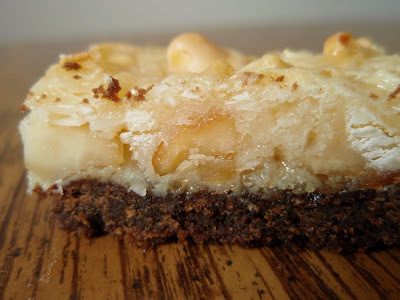 My father in law loves macadamias, I'm going to make these for him for father's day :). Macadamia nuts...yum! These look awesome! Love, love, love Coconut and macadamia nuts...must try! Grace.... As I am just down the road a bit from you, I SO second your opinion about this blasted weather! I think that these bars are the perfect answer though! Here's hoping that we get some nice weather to stick around for awhile! I'm going to make some Dollies immediately with Chocolate Grahams--why didn't I think of that? Brilliant, and thank you! Macs are my favorite. So, so nice gracie. What a fabulous way to will the weather to get warmer! I love a good tropical recipe. These bars look totally fantastic. A perfect way to use those macadamia nuts! You and me both, sistah. Even with the sunshine, it's just. so. cold. Ugh. And I'm with you--it's time to start eating stuff that puts one in the mind of warmer weather until it finally arrives. I'm so sick of root vegetables. Forget local, I'm getting imported lettuce and zucchini, baby! 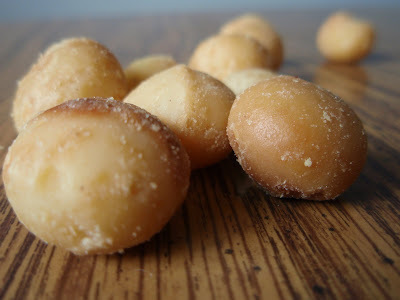 Macadamias are a real pleasure snack in my world... sooooo delicious! This recipe looks like a great use of them, too. Yummy! Wow...these have everything that's good to eat. Please stop by. I've left you a little award. The bars look amazing. I am really craving a sweet treat now! these bars are awesome! and those ice-cream malts sound pretty good too! You made good use of your goodies and the bars - out of control. I'm getting fatter just looking at them. Indeed, lets just go with that white chocolatey yumminess. Since were pretending to be tropical and all, why not? If you lived on that tropical island, you would probably complaining about those damn hurricanes! Good Gats! Yes I , too have had enough of this NY cold. So wanting Spring! I may have to stop reading your blog because everyday it's something else that I love and absolutely have to make...and consume immediately. I'm working on polishing off a batch of pecan pie muffins. These will be next! I swear... I'll eat anything with macadamia in it and these look just... wow. These look tremendously delicious!! Love the tropical flavors.. Would love one with a pina colada or two. Macadamias? Chocolate? A tropical island? You're playing my song!! Oh my, that's a tropical love right there! Bananas and chocolate and coconut? You're after my heart. Oh Grace, this sounds like tropical heaven!! Macadamia, coconut and white chocolate!! Wow, I'm slobbering all over my keypad!! Take me to the tropics, darling. Mention macadamias and I'm already there! I love macadamia nuts! So unfortunate how fatty they are....I could eat a giant pile. Oh, I think I'd like your aloha dollies much better than the original! I love that saying, "that's how I roll"! When my children ask me why, that's what I tell 'em. LOL! Of course that gets the eyes rollin'! Very creative and looks delish! It's raining in Tennessee. Makes me sleepy. Too bad I can't nap at my desk. Hmmm. Who needs a warm climate? I'd rather be cuddled up on the couch with a fire in the fireplace eating these! Hahahah, I HAAAATE warm climates! I'm loving the cold weather here in Oxford. Aaanyways, those bars... oh man, they're beautiful and they're calling out to me!!! The banana pieces looks really tastey! Sending warm thoughts from the desert south west! Oh, I can just feel my teeth sinking into this awesome dessert! Add a cup of coffee and enjoy heaven! Gald I found your blog, I spent the afternoon copying recipes! You have some great ones. Come visit GrannyMountain! I know all about that whole weather thing! On the other hand these macadamia dollies will just make everything right! Just looking at them, makes me warm all over! Great blog - and these look great. Just hosted a caribbean themed dinner party, if only I had found these. Next time! Grace- You won my giveaway, please contact me with your mailing info so I can get it out to you..
Ooooh macadamias, they're Australian just like me. Delicious!! WOW! all my favorite stuff in one bar! this is AMZING!send me to the tropics already! Aloha is right...that is what my mouth is saying. These look yummy. Yum, yum!!! Aloha, here I come!